There were more mistakes. 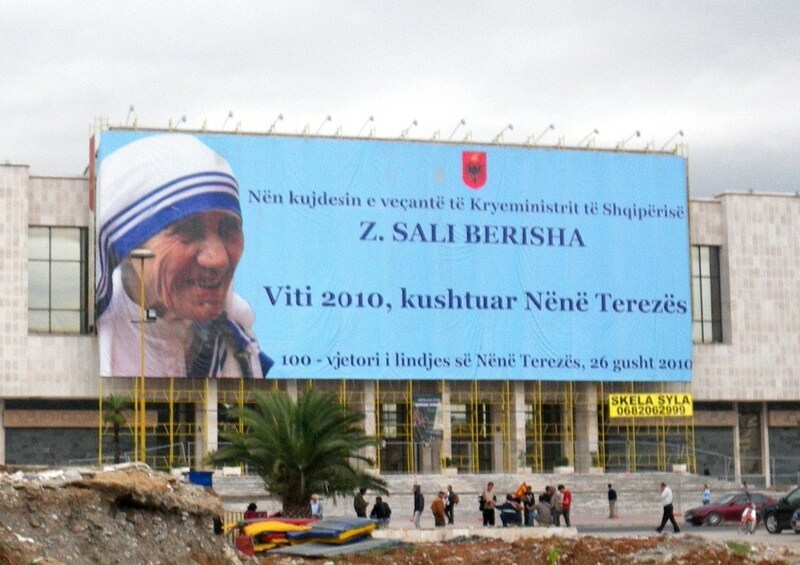 Massive posters with the image of Mother Teresa were scattered throughout Tirana, and the seemingly English phrase “In memorial” topped them. However this was in fact a spelling mistake of the Latin phrase “In memoriam”. Several were corrected by pasting the letter m over top of the letter l which looked like Memoriahn, while others remained unchanged. It quickly became obvious how little preparation had been made. Blunders like these suggest a Government with unqualified people working within it. The fact that these errors “slipped through” demonstrate poor attention to detail and indicate last minute planning. The following day the art exhibitions began. Exhibits were held in the International Cultural Pyramid Arbnori, The National Gallery and the National History Museum and of the three, only one clearly indicated it was about Mother Teresa. It was not apparent what the viewer was looking at in the exhibit entitled “The Miracle of Love” at the National Gallery, and though slightly more relevant the same held true in the Arbnori. These exhibits could have been about anything. Beautiful but uninspiring works were chosen, and while it is the task of a curator to select relevant pieces, these had a very obscure connection to Mother Teresa, if any at all. In a country where at times favours outweigh integrity, it is no surprise to see the irrelevance of the pieces selected. Days later, politicians described the exhibitions as “spiritual”. At the National History Museum, there was a well organized display of paintings, photos, relics, sculptures and a short video. 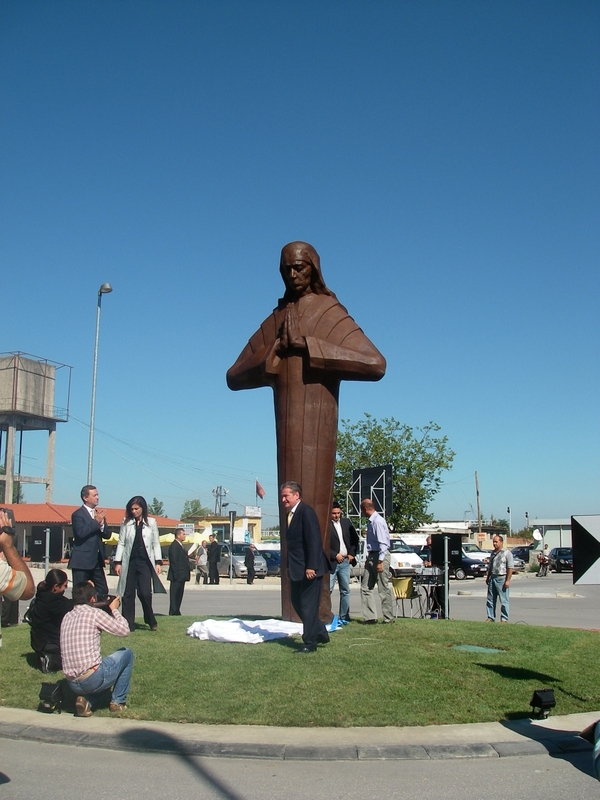 The theme of this exhibit was clear, and was to draw attention to the fact that Mother Teresa was Albanian. 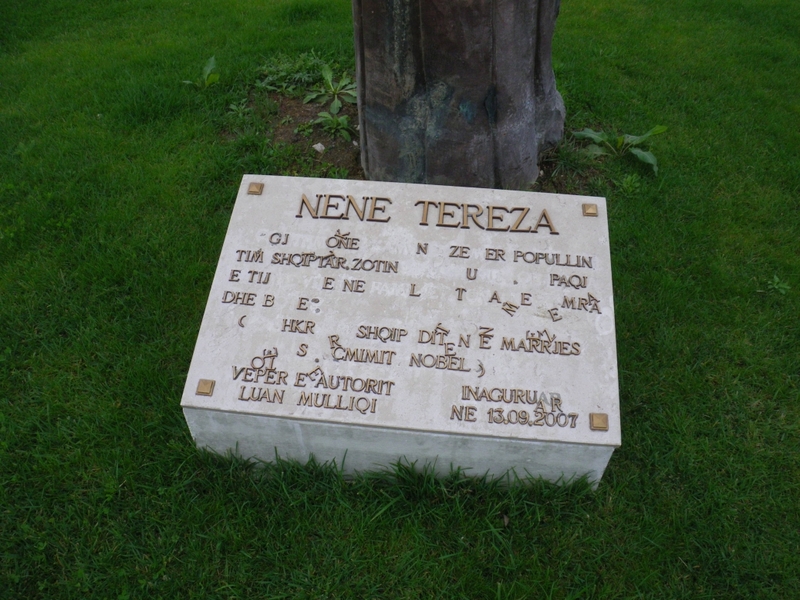 This was indeed a meaningful exhibit for Albanians, however it was not a commemoration of her life’s work and humanitarian achievements, simply one of birth and ancestry. The following week, the “Great PEACE Concert – Homage to Mother Teresa”, was held at the National Theatre. 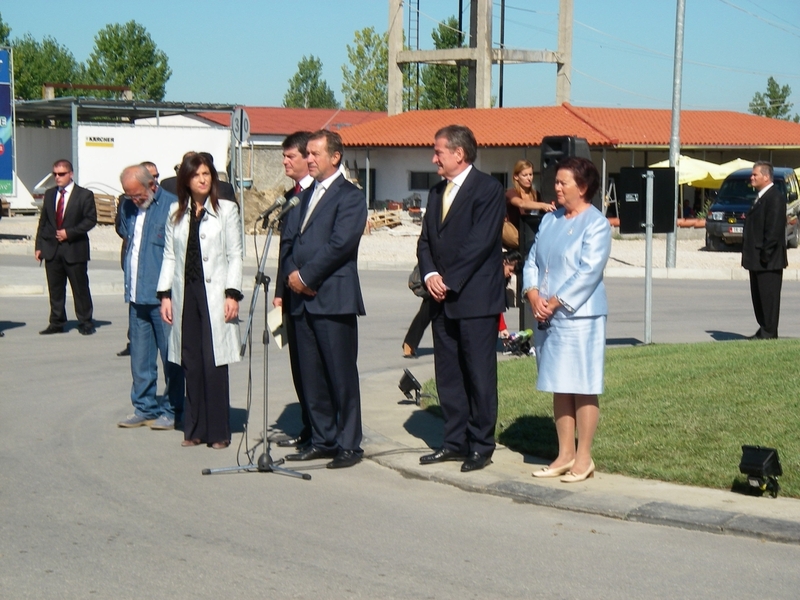 Organized by the wife of the Prime Minister, Liri Berisha and The Minister of Tourism, Culture, Youth and Sport, the concert featured classical artists from Europe and the Balkans, including an orchestra, a choir and several soloists. It was by invitation only with politicians, high society, and foreign dignitaries among the guests. Blue and white sashes resembling the clothes of Mother Teresa were distributed at the door, and youth in traditional Albanian costumes greeted guests. A statue of Mother Teresa stood behind the performers on the stage. The musical selection appeared well calculated, closing with the symphony which is used as the anthem of the European Union. Cell phones were in action until the end, and people’s attention drifted. Theconcert to promote peace excluded virtually all Albanians, while those who attended seemed to wish they hadn’t. 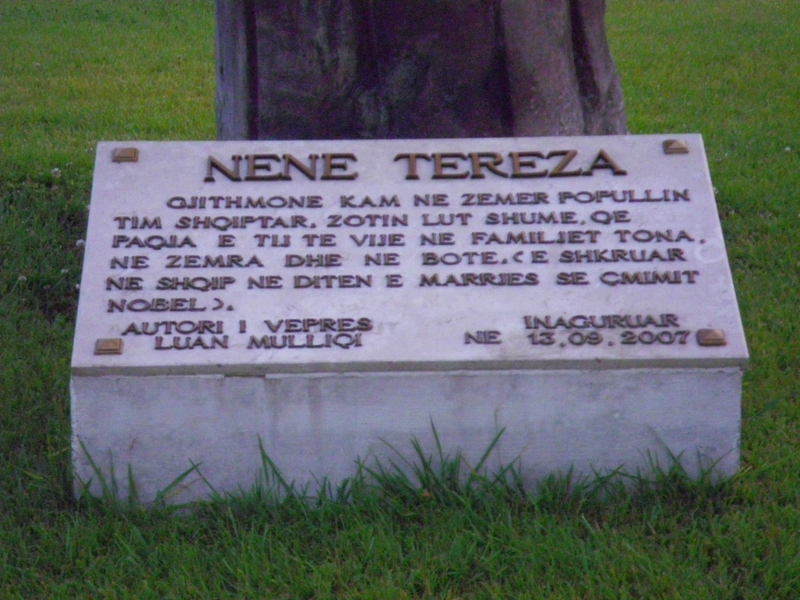 While the concert added to the high culture of Tirana, it did not contribute a great deal either to peace awareness or to Mother Teresa’s work. She opened soup kitchens for the hungry, hospitals for the sick, orphanages for the homeless, not concerts for the elite. That same night countless children and their families slept outdoors in the streets of Albania, cold, hungry and wet from the rain. It is unlikely that any of these people even knew about the “Great Peace Concert”, which more suitably could have been called “Peace, by invitation only”. Beautiful and empty words. A news report that week about Tirana’s hospital, ironically named Mother Teresa Hospital, explored the hospital’s poor equipment, lack of beds, and inadequate staff and supplies. A week later, scandals involving blood infected with HIV made headlines, followed the next day by heroin dealing within the hospital. These seem not so unlike the conditions Mother Teresa herself worked in for so many years in the gutters of Calcutta. But this is the major hospital in the capital city of a nation who claims her as its own, and while 50,000 euros worth of art exhibitions, peace concerts and commercials promoted her name and heritage, the sick and uncared for remained sick and uncared for. 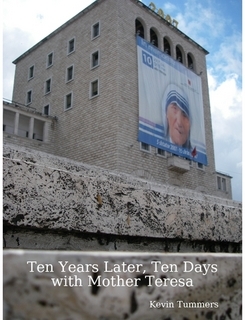 On the anniversary of her death, basic services at Mother Teresa Hospital in Tirana were free to the public. This act was a true reflection of her legacy, and was by far the most significant and most relevant act made throughout the entire ten days. During these two weeks, there was no word of anything done by other ministries, including the Ministry of Social Affairs and Equal Chances, who could have certainly offered service to those “shunned by everyone”. With a small degree of communication, several ministries could have cooperated to organize a socially just and relevant tribute to Mother Teresa. Towards the end of the tribute, politicians, dignitaries and a contingent of media gathered at Mother Teresa Airport to unveil a four metre bronze statue of her. The sculpture was commissioned in conjuncture with the opening of a new terminal earlier in the year, but was not ready and thus added to the anniversary events (in ceremony, not budget). President Topi gave a speech with words to the effect of Mother Teresa being a universal saint who never forgot she was Albanian, and that she was a role model for everybody to follow. The ceremony was brief and lasted a no more than 10 minutes. It isn’t known what the cost of transportation and security for the dignitaries was, but it is certain the money would have been more effectively spent on hospital supplies and increased care, and it wasn’t. Albania is a country where the media portrays the leaders as demi-gods, flashing them on TV dozens of times a day. These ten days gave The Prime Minister, The Minister of Culture and The President two weeks worth of positive exposure. Other things the country gained from this tribute included a chance for the upper crust to mingle, and plenty of “on the job training” for the Prime Minister’s security team. It also gave Albanians two weeks of blind nationalism, reminding them that a famous person came from an Albanian family (albeit she was a pioneer in the Albanian brain drain, leaving at a young age to learn another language and help another country). The failures of this event heavily outweighed any successes. 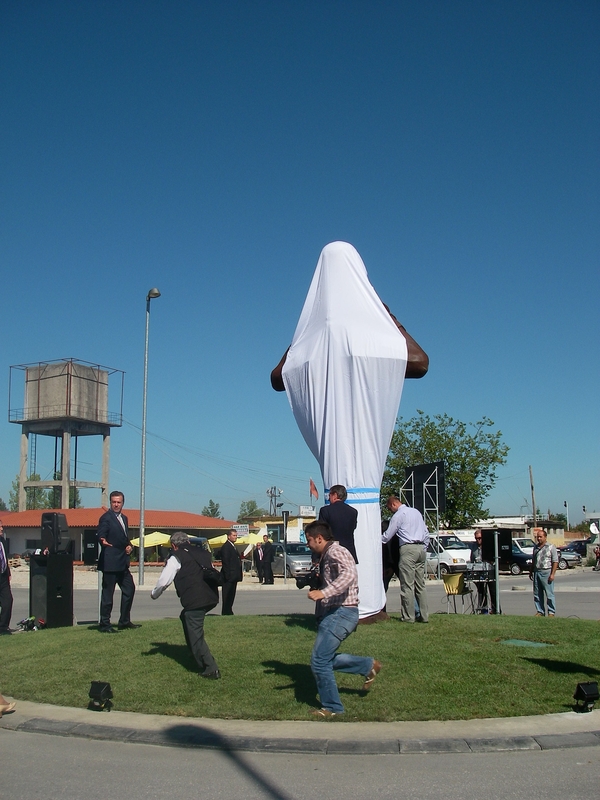 The event showed a government lacking professionalism, cooperation and attention to detail. It showed it can exclude its citizens, and it can present a version of history appropriate to its agenda. The people truly in need saw little to none of the benefits of these events, and after all is said and done little has changed. The hungry still scavenge, the homeless still sleep in the streets and the unwanted are pushed further away. I find it unlikely that Mother Teresa herself would have attended any of these events, for she would probably rather have found herself at the hospital, or in the streets helping those who needed help. 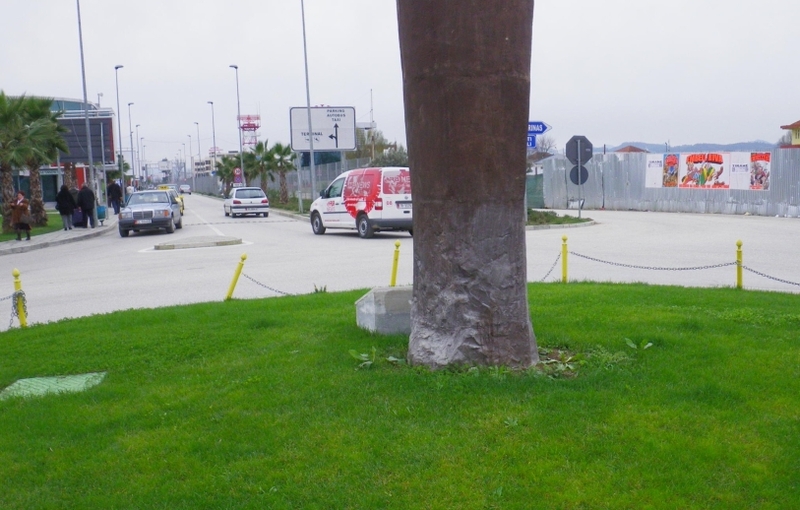 Below are the shoddy repairs to the base of the scupture, after being hit by a car in 2009. On the right is the state of the plaque as of May 2010. The plaque has been fixed. Back at it again…this time at the National History Museum in the city centre of Tirana. Notice who’s name is bigger and bolder?!! I really enjoyed the website. That’s always nice while you’re reading something which isn’t just informative but entertaining. Outstanding! Thank you for making the effort to talk about this.